Low priority in Inbox can really be a confusing bundle. What goes there? How is it different form other bundles? How is it similar to anything in classic Gmail. All of these are questions I see a lot in the forums and on various social media. 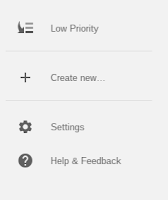 For those that switched over from classic Gmail, the Low Priority bundle will be automatically turned on and bundled in the Inbox if you used the Priority Inbox or Important First setup. Inbox Low Priority, is essentially the same thing as emails that are marked as Not Important in classic Gmail. Simply put, items such as promotional messages or social emails may end up in your Low Priority bundle. For me, I never even look at low priority. After the first few weeks of using Inbox, I came to realize that the Low Priority messages were also found in my Promos bundle. That is why I have never seen the Low Priority bundle appear in my Inbox, even though I have it set to bundle in the Inbox. As explained in the Inbox Help Center on this topic, if the message is bundled ONLY in the Low Priority, then it will show in the Inbox under low Priority, however if it is also bundled in another bundle, such as Promos, then it will ONLY appear in the Promos bundle in the Inbox. Remember, just like every other bundle, you can turn off Low Priority from bundling in the Inbox altogether, or you can set how often you want it to appear in the Inbox (daily, weekly, as messages arrive). For the reasons described above, I have turned off the Low Priority from bundling in my Inbox. Hope this helps clarify things. Let me know in the comments below if you have any questions. there seems to be a very high correlation between the mails in *Low Priority* and Unroll.me [ a service I use to manage my subscriptions ]. Is there a way to automatically mark all low priority inbox as read?